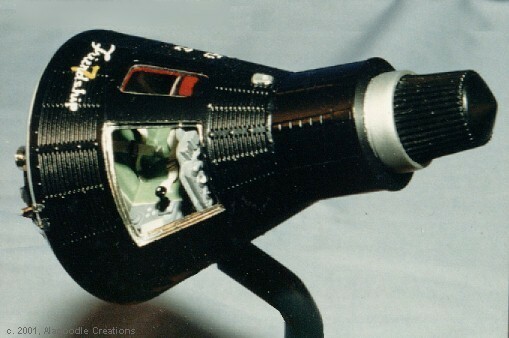 This Mercury Capsule was built using an Estes flying rocket nose-cone for the outer hull. The front, rear and lighted interior were all scratch-built and markings were home made decals. Construction was based on an article by Ken Brill in Fine Scale Modeler magazine, October, 1987. The retro-pack is made from a section of 1 inch diameter acrylic rod. The retro-rocket nozzles are vacu-formed styrene. The straps are made of masking tape and sheet styrene. Both the hatch and window were cut out and shaped by hand.